Oh, I have to have these!!!! Ohhhh, especially lovely set this time around! What a delightful assortment. I'd love to have these in my collection. These you can pass down to your grandchildren for years to come. Lovely gift!! Vintage children's books are the best! Several of these kept me company during months in a hospital when I was a child. Would love to win them and enjoy them again. Would love to win the children's books. 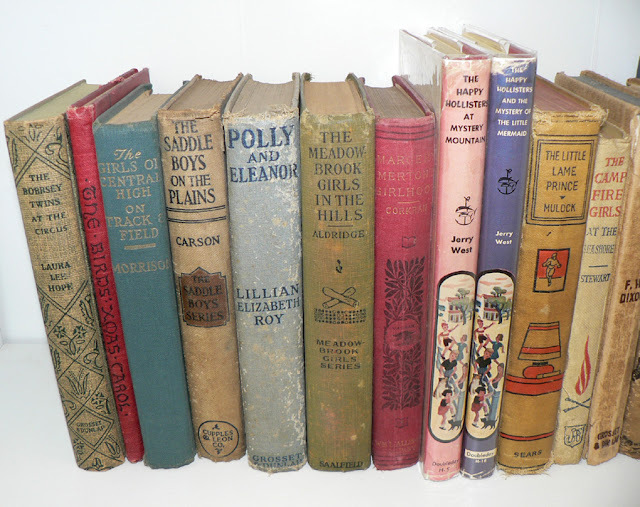 I am collecting books for my grandkids and future great grand children. I collect children's books I love children books. Would love to winner. 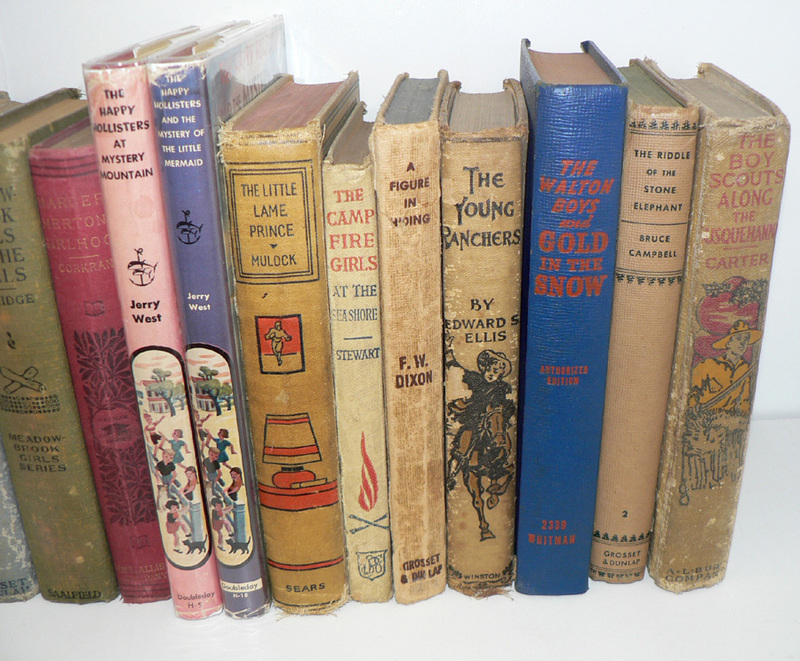 I Love children's books and would love to win these for my collection. Happy Hollisters! I love those. The Bobbsey Twins! Oh I hope I win this one. Thank you! love childrens books and love to win to read and add to my collection. We had the Bobbsy Twins series - about the same vintage you have in the picture. What a delight to see that book again! 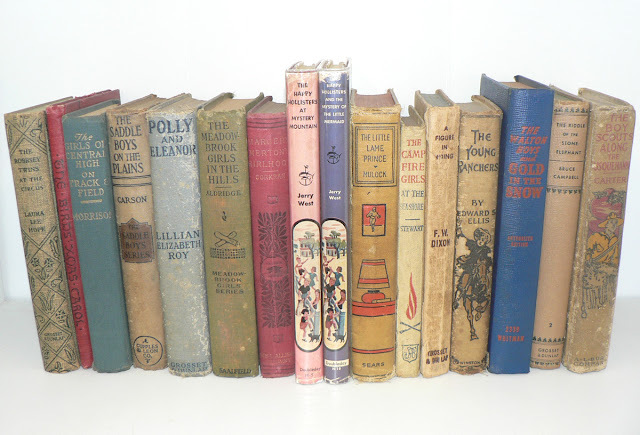 I collect vintage kids books, read them over and over. LOVE this collection!! Thanks! Love this set, great selection today, thanks so much for the chance. Perfect for a middle-aged gay guy! Those are beautiful. It makes you wonder what kid read each particular book first. Books are lie chocolate, there is never enough. Especially vintage, beautiful inside and out. My daughter would love to read the Camp Fire Girls book! I read to my grandkids every night and these would be great for that. oh i'll never not love my old children's books! what a lovely selection. These are beautiful. I hope to do my dissertation someday on Children's Literature. What a gem these would all be. I read all the Happy Hollister books as a kid. Loved them. Then I moved on to Nancy Drew. Count me in! Real treasures from the past. Ooh, ooh, me please! Kidlit is what I collect! I love the old children's serials. How I love Vintage books. Thanks for the opportunity to win. Oh, I sooo want these! I'm a school librarian, and they would be perfect in my office. What fun these would be to add to my collection! Oh, the pleasure of rollicking adventure book! All remain one of our life's best joys! Can you tell I love this kind of book? I have saved all of mine from childhood but don't have any of these. I remember the Birds' Christmas Carol, too -- a pathetic Dickensian tale! Please pick me! Great selection! Hope I win. My granddaughters love to read and are the right ages to read these books. I have tried to buy them books several times a year to add to their growing library. Nice, hope I'm not too late!